Sometimes I like to sit back and take in math via pictures only. The newest addition to my math picture blog stable is kettenreihen.wordpress.com where three times a day, a beautiful picture appears. These are graphs of complex-valued functions based on continued fractions. White points are where the function takes on real values, black are imaginary, and the other points are colored according to angle. On the blog’s “about” page, Baruchel explains the notation, which is not the most common continued fraction notation. It’s fun to look at a graph and try to figure out why it looks the way it does: why are there purely real or imaginary values in particular places, why a graph has horizontal or vertical symmetry, and so on. These are not straightforward functions, so I must admit I don’t always get anywhere, but it’s fun to think about anyway. 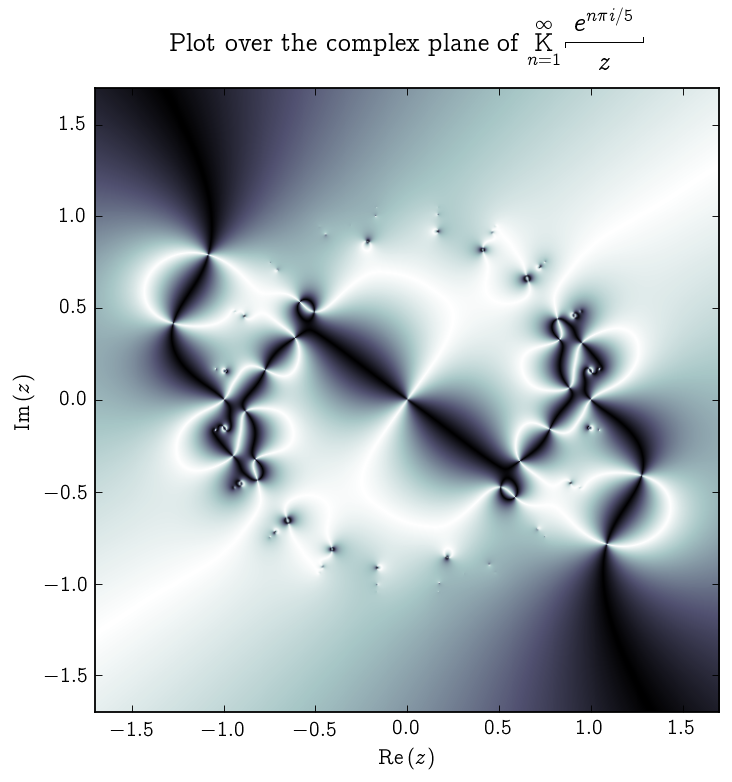 If I were teaching complex analysis, I would probably try to work this blog into my class somehow, if only to gawk at pretty things with my students. I’ve been trying to decide which kinds of graphs are prettiest. “Flowers” are nice. Graphs that evoke mathematical symbols are always on trend. And so are the wild, busy ones. Luckily you don’t have to choose. Just add the blog to your feed, put your feet up, and relax with some gorgeous mathematical illustrations. This entry was posted in Mathematics and Computing, Mathematics and the Arts and tagged complex analysis, illustrating mathematics, math, mathematics. Bookmark the permalink. thanks. Such pictures are sheer joy to the heart and head. Thanks to you for sharing, and to the author/creator. Wow!! These plots are very interesting. I’d like to know the method used for such image generation.